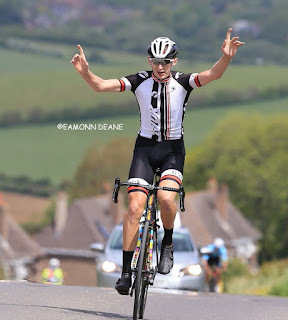 Winner of the recent Bournemouth Jubilee 2 Day, Luke Barfoot ( Tri UK) wins the Portsmouth North End CC race in Hampshire. "So there was 4 of us from Tri Uk racing and we all wanted to make a good show. Giles(Greening)and Sean(Frost)both both got in the early break, while me and Ben(Lockett)were just blocking and stopping any chases from developing. I knew I had decent legs but wanted to save it until the right time. When we caught the break of 5 on the bell lap. I decided to hit them straight away, looked around and everyone just sat up. I was just focused on getting to the line first and not worried about the chase behind. My confidence is good at the moment and results are coming"
Well done Harry Johnson, the only Junior in the race and under-geared.